Working in response to customer demand, RPC Containers UKSC has developed the world’s first lightweight 130g UN approved free-standing 5 litre jerrycan for the transportation of hazardous products. Traditionally UN approved containers in this size are transported as a combination pack of either two or four containers inside a cardboard carton. RPC has now achieved a 130g free-standing version, produced in a special grade of polymer which provides excellent rigidity along with high impact performance and resistance to stress cracking. RPC is using high-tech moulding machinery to ensure optimum material distribution in order to maximise overall strength. 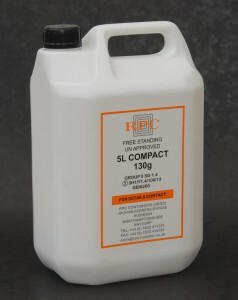 As a result, the 5 litre Compact 130g UN container is able to withstand the stringent requirements of UN approved packaging, achieving Group 2 approval for free-standing use for products with up to 1.4 specific gravity.The new lightweight pack has the potential to reduce transport costs as well as having a positive benefit on customers’ overall carbon footprint.